A great way to get your message out is with wrist bands. 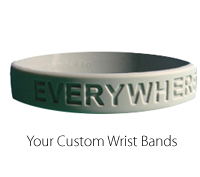 Add your name, message, logo, or your contact information to these easy and popular wrist bands. You choose the wording, you choose the color, and you choose the quantity. We will take care of the rest!